Breakfast is available at a nearby Cafe, the cost is 70 kr. 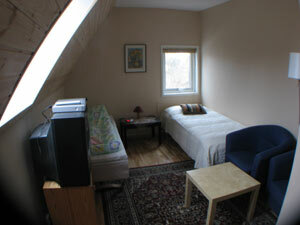 We have four pleasant rooms, with a total of seven beds. There are two common bathrooms with toilet and shower. The guests also have a fully equipped kitchen and a lounge area at their disposal. All the rooms have their own entrance and are completely free of smoke and animals. We are welcoming you to a pleasant stay at Kristianstadsrum. Kristina and Jörgen with family.